A well-cared for garden shed should stand the wrath of winter with ease. It may get the odd chip here, crack there, and even hairline cracks or complete tears across the roof felt – but it’ll still be standing when Spring rolls around. When the better weather appears, it’s the ideal time to give it some TLC, making sure it’s looking great for the rest of the year and prepped for next winter. Did you know a quality wood shed can last as long as 30-years? That’s provided you take good care of it. They say sprucing your shed up is as easy as applying a coat of paint. That’s not exactly true. A water-based paint with no weather resistance is going to look terrible when the first bout of bad weather lands. Exterior paints for sheds need to be weather proof and it’s always better to add a “preservative” before painting. The reason being, paint isn’t only for aesthetics. It’s for protection against the elements. Wood preservatives are sealers and you can apply it to the interior of your shed walls too. How often should you treat your timber? It depends on the wood used. Annual treatments are recommended for most woods, unless it’s been pressure-treated or cedar wood, which don’t need treated as frequently. Felt roof lining doesn’t last forever! The roof on wood sheds should have a felt liner on it. Depending on the quality of the felt, it may need a double layer. Most quality felts only require a single layer, provided it’s applied with care and attention ensuring it fits snug, is airtight and not nailed down with rusty nails. 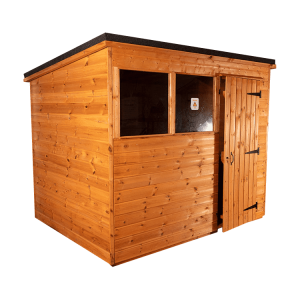 Provided sheds are located in a reasonably sheltered position, the felt may last as long as 15 years before it needs replacing. For sheds located more in the open where they take a beating from rain and snow every year, the felt can need replacing every two to three years and it’s important that it is. Inspecting the felt itself doesn’t always make it obvious where there’s damage. The easiest way to tell if your roof felt is holding up is to check the roof from inside the shed, while it’s raining or shortly after. Any weak spots will show a wet patch visible from inside the shed. If the weather’s dry, spray the roof with your garden hose and see if any wet spots appear inside the shed. If it does show a wet patch, it needs the felt renewed. Another thing to check your roof for is moss. Don’t confuse moss to be added protection. It’s not because it just sits absorbing moisture adding weight and wetness to the roof of your shed, shortening its lifespan. Save yourself some money and clean it off. Cracks and chips are common in wood sheds and they’re easily fixed, once you know where they are. That’s the difficult part as some can be so miniscule, they’re barely noticeable, but will still let water into the shed. The easiest way to see where there are any cracks and chips needing sealed is to look at each panel from the inside during the day. If you can see light, water can get in. The easiest solution is to use a caulking gun with a silicone-based caulk as that’s flexible enough to expand and contract with the wood, which it needs to do to prevent further cracking. The exterior of your shed shouldn’t have overgrown plants, soil or weeds too close to it. Those, similar to moss on your roof, absorb moisture, which can lead to damp, mould, and all the conditions needed for fungi growth. Before long, wood rot can set in. If you have a garden planter beside your shed, don’t let them overgrow as it can affect air circulation. The exterior of your shed should have plenty of air flow and nothing too water absorbent, otherwise there’s a risk of wood rot. Garden sheds are prime candidates for insects to set up home. Completely bug proofing is near impossible because you need ventilation. Where air can get in, the smallest creepy-crawly will too. All you can do is control them by being careful what and how you store things in your shed. The ideal harbouring materials for bugs are cardboard and newspaper. Textiles can be problematic too by encouraging fabric eating insects such as moths and the carpet beetle. In addition to cleaning, another preventative measure to keep bugs away is to keep your compost away from the shed, and wash all your gardening tools before returning them to the shed.